Our Products >> SHOOTING AMMO, Single Cartridges, Packages & Boxes >> PISTOL Calibers, Boxes & Packages, CenterFire Shooting Ammo >> INCH! Calibers, Pistol Boxes & Packages, CenterFire Ammo >> .375 JDJ, Obsolete, Obsolete, Shooting Ammunition. >> .375 JDJ by Thompson / Center One Cartridge, not a box! Maximum order is 1 cartridge on this item, do not order more then one or your order will have to be canceled. Please Note: Because this cartridge is used in both a pistol or rifle firearms, it is listed in both Shooting and Collectible Pistol and Rifle Sections. History of 375 JDJ: The 375 JDJ was designed by J. D. Jones of SSK Industries in 1978 as a Wildcat Cartridge, formed from the 444 Marlin "Parent" cartridge used in the custom JDJ barrel for the T/C Contender. 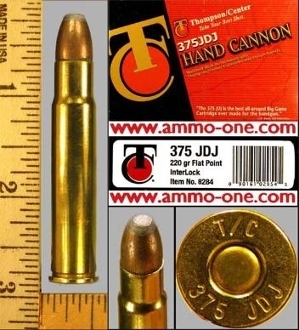 The 375 JDJ was a "Wildcat" cartridge, until 2004, when Thompson Centerfire (T/C) marketed this caliber in T/C barrels for the Contender and Encore firearms, and the cartridge was produced by Hornady for T/C.